In 2012, Zimbabwe launched the Campaign on Accelerated Reduction of Maternal Mortality in Africa (CARMMA) under the theme “Zimbabwe Cares: No Woman Should Die While Giving Life!”, initiated by the African Union. This programme prescribes the registration of pregnancies within 16 weeks after conception, antenatal care, delivery at a health facility and access to post-natal care 48 hours after delivery. The potential of this programme’s actual impact on the maternal mortality rates is questionable, seeing that women tend to avoid registering their pregnancies and going for prenatal visits because they cannot afford the registration and consultation fees (which is $ 30). The programme also naively presupposes the availability of resources and medical staff. In March 2013, the Ministry of Health and Child Welfare made a seemingly commendable gesture to address the shortcomings of its CARMMA programme by announcing that maternal user fees will be scrapped in rural areas. However, over-worked health care professionals fear the effect that the successful implementation of such a policy could have on the resource-barren public healthcare facilities. Women who cannot afford maternal user fees and opt for home-births, although placing their lives and the lives of their babies on the line, do take a considerable burden off the healthcare system. A similar waiver-announcement was made in July 2012 but was dubbed a mere “pilot project” after a few months of scant implementation and public confusion. If the waiver policy is to be properly implemented this time round, government will have to fill many more holes than just those left by the user fees per se. On 28 May 2013, a newly adopted constitution made provision for the right to health and explicitly acknowledges a right to reproductive healthcare services. The inclusion of this provision is celebrated as a major breakthrough which delineates the state’s obligations in respect of the delivery of maternal healthcare services. However, it seems unlikely that an additional constitutional entrenchment of the right to health will have any substantial impact on the reality that women face. The state has been bound to ensure access to maternal health care services in terms of international agreements, prior to and during the worst bouts of disintegration of the public healthcare system. The government has consistently disregarded its duties to increase resources to the necessary services, to develop and implement policies, and to address social issues which prevent women from gaining access to maternal health care. 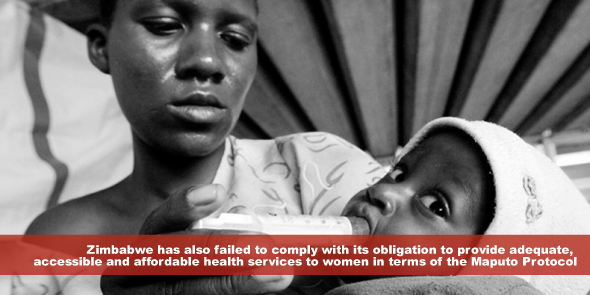 Zimbabwe has also failed to comply with its obligation to provide adequate, accessible and affordable health services to women in terms of the Maputo Protocol. Finally, Zimbabwe has allocated a mere 8% of its national budget to healthcare in 2012 and is thus failing to live up to the 15% allocation which was promised in the Abuja Declaration in 2000. If Zimbabwe was to allocate the necessary funds to the health sector, perhaps their CARMMA programme, maternal user fee waiver and constitutional entrenchment of the right to health could be viewed as plausible attempts to relieve maternal mortality. Linette du Toit holds a Bachelor of Laws (LLB) degree from the University of Pretoria and is currently an LLM candidate (Human Rights and Democratisation in Africa) at the University of Pretoria’s Centre for Human Rights (South Africa). Her research interests include human rights and women’s rights. This article is a result of a field research trip to Zimbabwe conducted in April 2013. Zimbabwe’s plight is as a result of blockade from the west. They havee since the above cited date(2008) been treated as a pariah state,until China now has decided to come to the rescue. The west are very vindictive.